The 25m StratoSphere was once again rolled out for another impressive series of events, this time in collaboration with MAPP3D, a Madrid based events company. The first leg of this world tour was in Beijing, China, before moving on to Madrid, Spain. The StratoSphere made a huge impact, as the location was right in the heart of Madrid and so it was able to generate a lot of attention before the show was even open. A tight schedule meant the StratoSphere was installed and inflated in record time, and once up was quickly dressed by the team from MAPP3D. Impressive art installations, history and tourism information, as well as interactive visitor guides were all set up, filling the 400m²+ of floor space. 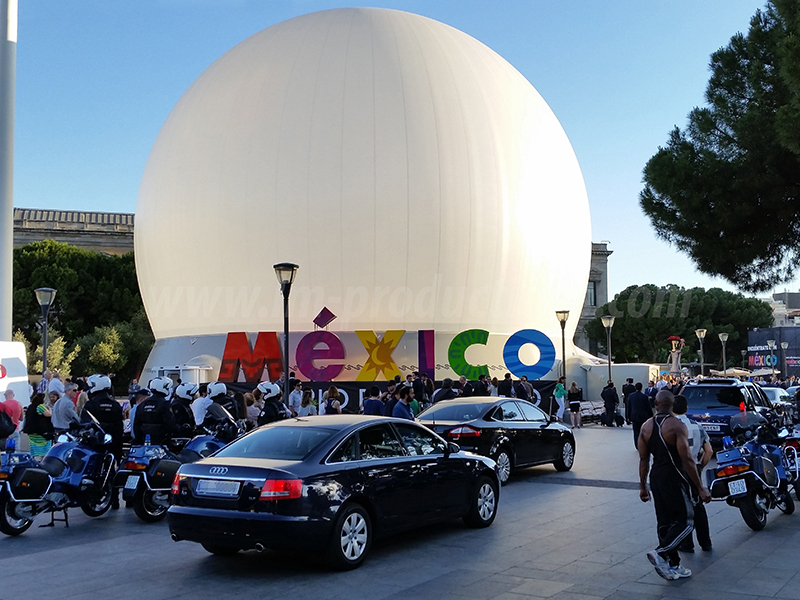 This was then topped off with incredible visuals made especially for the StratoSphere, showing Mexico's natural beauty, culture and historical landmarks. With the show running throughout the day, the 25m BlackOut Dome was constantly in use, allowing us to separately brand the StratoSphere exterior with giant banners with the tour logo without it compromising the interior video.